BACKGROUND: Azithromycin has been used for many years for the treatment of patients with various types of bacterial infections, as well as for the secondary prevention of coronary events. There is a growing concern, however, that azithromycin may be associated with an increased cardiovascular (CV) risk and may lead to CV-related death in high-risk patients. OBJECTIVE: This systematic review of randomized controlled trials was conducted to analyze and describe the CV risk and safety outcomes associated with azithromycin therapy. METHODS: A meta-analysis was conducted based on the MEDLINE, EMBASE, and Cochrane Central Register of Controlled Trials databases from 1990 through September 2013. Specific medical search terms in the English language included “azithromycin,” “macrolide,” “antibiotic,” “cardiovascular diseases,” and “cardiovascular events” and were used to identify relevant randomized clinical trials that assessed the risk for CV events in patients receiving azithromycin therapy or placebo. 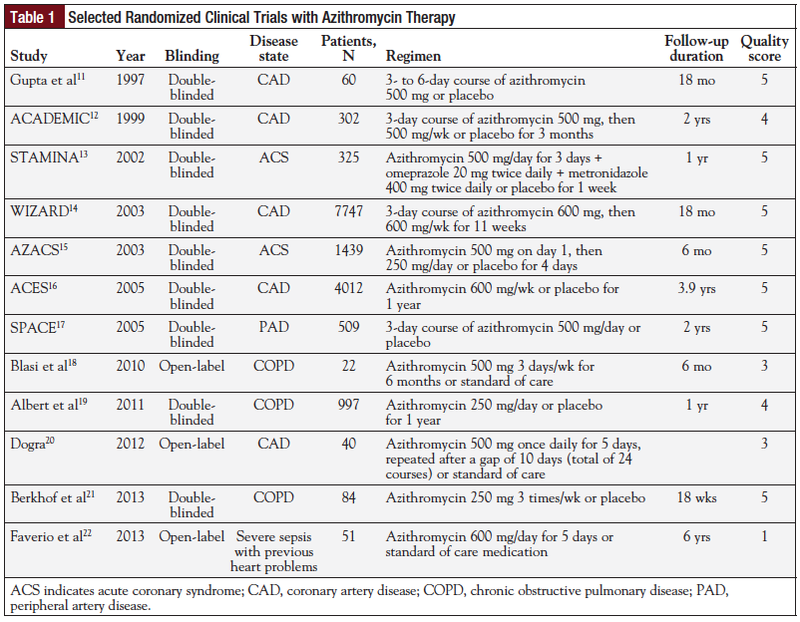 The randomized clinical trials that were selected included patients who received azithromycin or placebo for the treatment of infection or for the secondary prevention of coronary events. Major health outcome measures included mortality, hospitalization, and coronary intervention. Meta-analyses were performed using a random effects model. RESULTS: A total of 12 randomized clinical trials included 15,588 patients. Patients were divided into 2 groups, either to azithromycin therapy or to placebo. Compared with patients who had not received azithromycin, patients who had received azithromycin had an overall risk ratio (RR) of death of 0.877 (95% confidence interval [CI], 0.752-1.024; P = .097). No heterogeneity was observed (I2 = 0%). Similarly, no differences were found in the pooled RRs for hospitalization or for clinical intervention for CV events (RR, 1.005; 95% CI, 0.922-1.094; P = .915; I2 = 0% and RR, 0.999; 95% CI, 0.896-1.125; P = .984; I2 = 0%, respectively). CONCLUSION: No increased risks for mortality or for CV events associated with azithromycin therapy compared with placebo were found among patients included in the 12 randomized clinical trials reviewed in this analysis. The opinions and conclusions expressed in this manuscript are solely those of the authors. Both studies agreed that patients who had the greatest baseline risk for CV disease were at highest risk for the disease from taking azithromycin.5,8 Any antibiotic is going to have risks and benefits; however, both studies were observational, and even the most carefully executed observational study can be misleading. A double-blind, placebo-controlled trial is the best way to eliminate such potentially misleading information.9 Therefore, we conducted this current meta-analysis of all English-language published and unpublished, randomized, controlled, short- and long-term trials involving high-risk patients to investigate whether azithromycin is associated with increased CV death among this patient population. met the inclusion criteria; online resources, such as CV and infectious disease conference abstracts; as well as clinicaltrials.gov to ensure that we included all published and unpublished studies. To be included in this analysis, studies had to be prospective, randomized, placebo-controlled clinical trials involving humans and comparing azithromycin therapy with placebo or with standard of care. The population of interest was clearly defined as any patients who have been identified in the literature review as high risk for CV complications, such as patients with a history of heart problems, established coronary artery disease (CAD), myocardial infarction (MI), unstable angina, or peripheral artery disease (PAD); COPD; or critically ill patients (eg, patients with severe sepsis). The selected clinical trials included azithromycin for the treatment of infection or for the secondary prevention of coronary events. All studies had to have data on clinical cardiac end points and had to report the risk ratio (RR) of CV events that were associated with the use of azithromycin. Studies that did not report RR and confidence intervals (CIs) but reported enough information to calculate them were also included. Recent studies were included in the analysis if their data were duplicated in more than 1 study. Data were extracted and the study characteristics were recorded, including the author(s), year of publication, study design (randomized or observational, placebo or active-controlled, blinded or open-label), study sample size, duration of follow-up, and the dosing regimen. All studies reporting CV outcomes were collected and were stratified into 3 subgroups—mortality, hospitalization, and coronary intervention. The first study subgroup, mortality, included all studies that reported patients who died from CV causes, such as death resulting from arrhythmias, severe congestive heart failure, cardiogenic shock, or MI, or any other underlying cause of death consistent with a CV cause. The hospitalization subgroup included studies that reported the number of hospitalized patients as a result of nonfatal MI, stroke, or unstable angina, or any cardiac condition that required hospitalization (eg, resuscitated cardiac arrest). The final subgroup, coronary intervention, included all studies that reported patients who had coronary artery bypass grafting surgery or percutaneous coronary intervention. The RRs of CV events associated with the use of azithromycin and its 95% CI were collected or were calculated for each study. In the analysis, methods based on RRs were used. RRs were calculated using a random effects model (because we assumed that the treatment effect in all the studies included are not identical), and RRs and 95% CIs were used for each outcome. Statistical heterogeneity scores were assessed with the Higgins I2 test (a value of <40% was regarded as “heterogeneity might not be important” and a value of >75% as “considerable heterogeneity”). 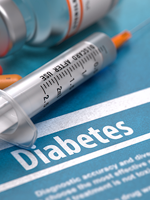 A sensitivity analysis was performed by removing some trials, recalculating the combined RRs for the remaining studies, and examining whether there were any serious changes in the overall results. Publication bias was assessed by visual inspection of a funnel plot of the logarithm of effect size versus the standard error for each trial. We looked at adequacies of the blinding of randomization, the blinding of treatment assignment, and the completeness of follow-up in each study to assess the quality of the study by using a scoring system developed by Jadad and colleagues.10 Meta-analyses were performed using the Comprehensive Meta-Analysis software (Biostat, Englewood, NJ) and SAS software version 9.3 for Windows (SAS Institute Inc, Cary, NC). A total of 6232 studies were identified after removing duplicate publications. Of the initial qualifying studies, 6110 articles were excluded, because they were not randomized clinical trials (these were reviews, editorials, letters to the editor, case reports, or meta-analyses). 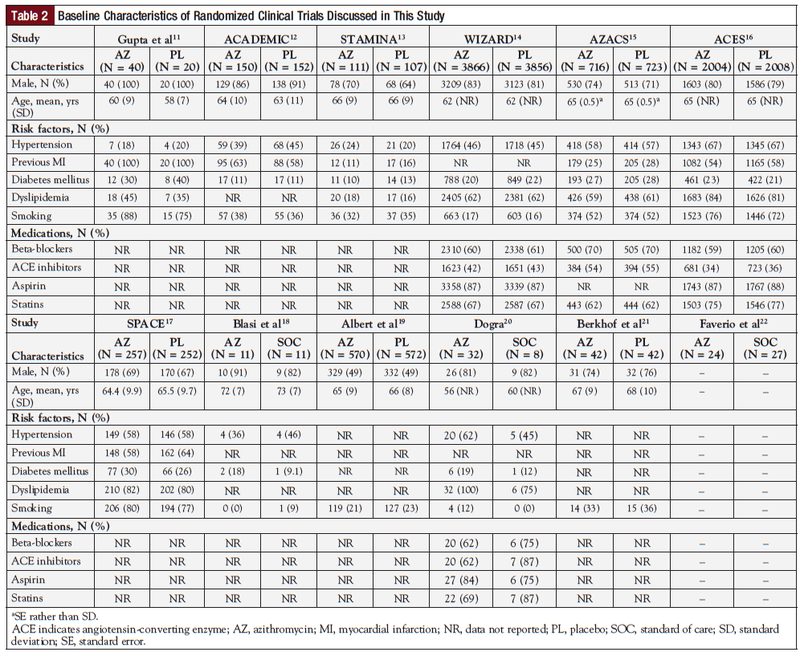 A total of 25 articles were excluded because they did not report clinical end points (Figure 1). Of these 12 studies, 9 were double-blinded trials and 3 were open-label trials. A total of 5 studies randomized patients with stable CAD, 3 trials randomized patients presenting with COPD, and 2 trials randomized patients with acute coronary syndrome. Patients with PAD or with severe sepsis were involved in 2 of the studies. The mortality outcomes were presented in 11 trials. Figure 2 shows the RRs and the 95% CI of death associated with the use of azithromycin in each study, as well as for all of the studies combined. Compared with patients who had not taken azithromycin, patients who had taken azithromycin had an overall RR of death of 0.877 (95% CI, 0.752-1.024; P = .097). The combined mortality rate was 3.7% among 7769 treated patients versus 4.2% of 7723 patients in the placebo groups. To assess the potential impact of the results of a poorer quality study, we performed a sensitivity analysis by calculating the RR using all the studies, and then excluding the 1 poorer quality study,22 as shown in Table 3. No change in the overall results of the analysis was detected. As for hospitalization, 9 trials reported hospitalization outcomes (Figure 3). No significant correlation between the use of azithromycin and the risk of hospitalization resulting from CV causes was observed in these studies (RR, 1.005; 95% CI, 0.922-1.094; P = .915) and no heterogeneity was found (I2 = 0%). The overall hospitalization rate was 7.6% among the 7498 patients receiving active treatment compared with a 10.1% rate among the 7478 patients receiving placebo. Regarding coronary intervention, 5 of the trials reported outcomes of coronary intervention (Figure 4). The analysis showed no relationship between azithromycin use and coronary intervention rate (RR, 0.999; 95% CI, 0.896-1.114; P = .984). Higgins I2 showed no heterogeneity among the studies in any of the subgroups (I2 = 0%). In the sensitivity analyses, no change in the overall estimate was observed after removing the poorer quality study and recalculating the combined RRs for the remaining studies. On visual inspection of the funnel plot, the plot appeared roughly symmetrical, suggesting that the likelihood of publication bias is relatively low (Figure 5). The findings from this meta-analysis of prospective studies show that either azithromycin therapy decreases CV and cardiac events or there are no differences in CV events and clinical cardiac outcomes compared with the use of placebo in these patient populations. All the trials included generally failed to produce convincing evidence to prove that azithromycin could cause CV events among high-risk patients. To our knowledge, this is the first meta-analysis conducted after the FDA alert was issued in March 20137 that has investigated whether azithromycin is associated with increased risk for CV events in the long-term. Our findings appear to conflict with the study by Ray and colleagues.8 There are several important differences between the observational studies included in the study by Ray and colleagues8 and the selected randomized controlled trials included in the present meta-analysis, which may, to some extent, explain the different findings. First, Ray and colleagues assessed the risk for CV death in patients receiving azithromycin, amoxicillin, ciprofloxacin, levofloxacin, or no antibiotics, based on retrospective data from the Tennessee Medicaid claims.8 Ray and colleagues specifically focused on the risk associated with the typical 5-day duration of the administration of azithromycin.8 It is unclear what was the disease state for which the patients with the Tennessee Medicaid coverage were receiving azithromycin therapy.8 The present meta-analysis specifically selected all randomized clinical trial data with azithromycin used for the treatment or for the secondary prevention of coronary diseases. Our meta-analysis has several strengths. All the studies included in this analysis have a prospective design, which eliminates the possibility of recall and selection bias. Studies with a long duration of follow-up were included to assess the long-term effects of azithromycin on the development of CV events. The characteristics of patients in the primary studies were always comparable. Little evidence of publication bias was found in the studies. Some limitations exist in the present study. The trials selected are varied in follow-up durations, ranging from 6 months to 6 years; however, most trials that examined azithromycin therapy followed the patients between 1 and 2 years. The primary CV end points also vary between the studies. Some of the selected studies reported all of the CV end points, whereas some did not. Similarly, some of the studies specified the causes of hospitalization, and other studies did not. We were therefore unable to distinguish if patients were hospitalized for acute angina or for MI. 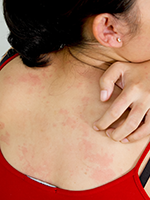 The treatment regimen and duration of azithromycin therapy were used either for treatment or for secondary prevention. Finally, the results of the present study may not be applicable for all other populations. The findings in this meta-analysis indicate that there is no increased risk for mortality or for CV events with the use of azithromycin therapy among patients enrolled in the treatment or prevention clinical trials included in this analysis. Future research considerations are warranted to study a larger number of patients with preexisting bacterial infection and CV risk factors, and longer follow-up duration of trials is needed to detect any potential long-term negative or positive effects, including CV effects, of azithromycin therapy. The authors would like to thank K. Lindsay Foltz for her English-language editing in the early version of the manuscript. Mr Almalki and Dr Guo reported no conflicts of interest related to the content of this article. No funding was provided for this study. Mr Almalki is a Graduate Student, and Dr Guo is Professor of Pharmacoeconomics and Pharmacoepidemiology, The James L. Winkle College of Pharmacy, University of Cincinnati Academic Health Center, OH. Hoepelman IM, Schneider MM. Azithromycin: the first of the tissue-selective azalides. Int J Antimicrob Agents. 1995;5:145-167. Zithromax (azithromycin) tablets and oral suspension [product information]. New York, NY: Pfizer Inc; June 2014. Mawhorter SD, Lauer MA. Is atherosclerosis an infectious disease? Clev Clin J Med. 2001;68:449-458. Belland RJ, Ouellette SP, Gieffers J, Byrne GI. Chlamydia pneumoniae and atherosclerosis. Cell Microbiol. 2004;6:117-127. Svanström H, Pasternak B, Hviid A. Use of azithromycin and death from cardiovascular causes. N Engl J Med. 2013;368:1704-1712. IMS Institute for Healthcare Informatics. Medicine use and shifting costs of healthcare: a review of the use of medicines in the United States in 2013. April 2014. www.imshealth.com/deployedfiles/imshealth/Global/Content/Corporate/IMS%20Health%20Institute/Reports/Secure/IIHI_US_Use_of_Meds_for_2013.pdf. Accessed August 25, 2014. US Food and Drug Administration. Azithromycin (Zithromax or Zmax). Drug safety communication: risk of potentially fatal heart rhythms. March 12, 2013. www.fda.gov/Safety/MedWatch/SafetyInformation/SafetyAlertsforHumanMedicalProducts/ucm343350.htm. Accessed August 25, 2014. Ray WA, Murray KT, Hall K, et al. Azithromycin and the risk of cardiovascular death. N Engl J Med. 2012;366:1881-1890. Noseworthy JH, Ebers GC, Vandervoort MK, et al. The impact of blinding on the results of a randomized, placebo-controlled multiple sclerosis clinical trial. Neurology. 1994;44:16-20. Jadad AR, Moore RA, Carroll D, et al. 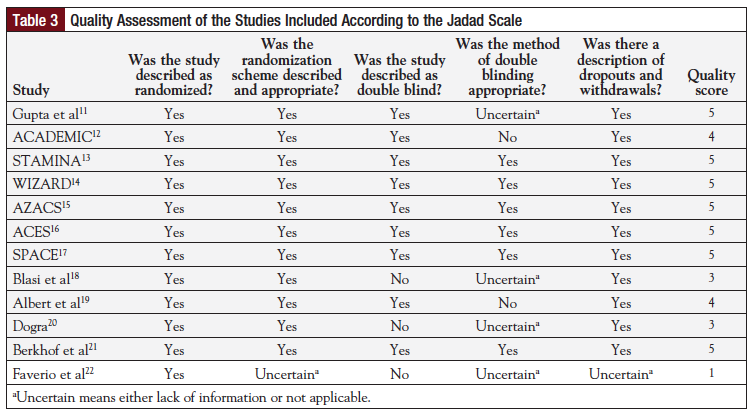 Assessing the quality of reports of randomized clinical trials: is blinding necessary? Control Clin Trials. 1996;17:1-12. Gupta S, Leatham EW, Carrington D, et al. Elevated Chlamydia pneumoniae antibodies, cardiovascular events, and azithromycin in male survivors of myocardial infarction. Circulation. 1997;96:404-407. Anderson JL, Muhlestein JB, Carlquist J, et al. Randomized secondary prevention trial of azithromycin in patients with coronary artery disease and serological evidence for Chlamydia pneumoniae infection: the Azithromycin in Coronary Artery Disease: Elimination of Myocardial Infection with Chlamydia (ACADEMIC) study. Circulation. 1999;99:1540-1547. Stone AF, Mendall MA, Kaski J-C, et al. Effect of treatment for Chlamydia pneumoniae and Helicobacter pylori on markers of inflammation and cardiac events in patients with acute coronary syndromes: South Thames Trial of Antibiotics in Myocardial Infarction and Unstable Angina (STAMINA). Circulation. 2002;106:1219-1223. O’Connor CM, Dunne MW, Pfeffer MA, et al; for the Investigators in the WIZARD Study. 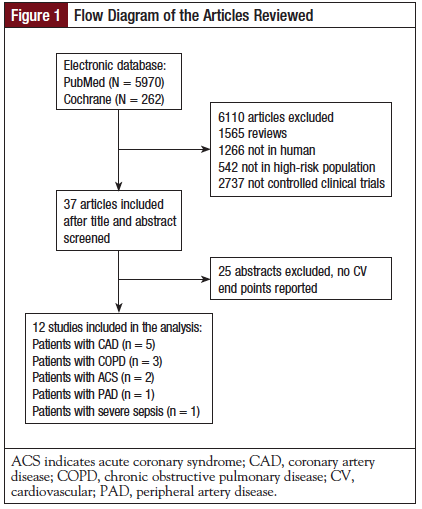 Azithromycin for the secondary prevention of coronary heart disease events: the WIZARD study: a randomized controlled trial. JAMA. 2003;290:1459-1466. Cercek B, Shah PK, Noc M, et al; for the AZACS Investigators. Effect of short-term treatment with azithromycin on recurrent ischaemic events in patients with acute coronary syndrome in the Azithromycin in Acute Coronary Syndrome (AZACS) trial: a randomised controlled trial. Lancet. 2003;361:809-813. Grayston JT, Kronmal RA, Jackson LA, et al; for the ACES Investigators. Azithromycin for the secondary prevention of coronary events. N Engl J Med. 2005;352: 1637-1645. Vainas T, Stassen FR, Schurink GW, et al. Secondary prevention of atherosclerosis through Chlamydia pneumoniae eradication (SPACE Trial): a randomised clinical trial in patients with peripheral arterial disease. Eur J Vasc Endovasc Surg. 2005; 29:403-411. Blasi F, Bonardi D, Aliberti S, et al. Long-term azithromycin use in patients with chronic obstructive pulmonary disease and tracheostomy. Pulm Pharmacol Ther. 2010; 23:200-207. Albert RK, Connett J, Bailey WC, et al; for the COPD Clinical Research Network. Azithromycin for prevention of exacerbations of COPD. N Engl J Med. 2011; 365:689-698. Erratum in: N Engl J Med. 2012;366:1356. Dogra J. Oral azithromycin in extended dosage schedule for chronic, subclinical Chlamydia pneumoniae infection causing coronary artery disease: a probable cure in sight? Results of a controlled preliminary trial. Int J Gen Med. 2012;5:505-509. Berkhof FF, Doornewaard-ten Hertog NE, Uil SM, et al. Azithromycin and cough- specific health status in patients with chronic obstructive pulmonary disease and chronic cough: a randomised controlled trial. Respir Res. 2013;14:125. Faverio P, Arango A, Anzueto A, et al. Azithromycin-related cardiovascular events and deaths in severe septic patients. Chest. 2013;144(4_MeetingAbstracts):422A. Perry TW, Pugh MJ, Waterer GW, et al. Incidence of cardiovascular events after hospital admission for pneumonia. Am J Med. 2011;124:244-251. Martin-Loeches I, Lisboa T, Rodriguez A, et al. Combination antibiotic therapy with macrolides improves survival in intubated patients with community-acquired pneumonia. Intensive Care Med. 2010;36:612-620. Rodríguez A, Mendia A, Sirvent JM, et al; for the CAPUCI Study Group. Combination antibiotic therapy improves survival in patients with community-acquired pneumonia and shock. Crit Care Med. 2007;35:1493-1498. Clayton TC, Thompson M, Meade TW. Recent respiratory infection and risk of cardiovascular disease: case-control study through a general practice database. Eur Heart J. 2008;29:96-103. Libby P, Egan D, Skarlatos S. Roles of infectious agents in atherosclerosis and restenosis: an assessment of the evidence and need for future research. Circulation. 1997;96:4095-4103. Leinonen M, Saikku P. Evidence for infectious agents in cardiovascular disease and atherosclerosis. Lancet Infect Dis. 2002;2:11-17. Saikku P, Leinonen M, Tenkanen L, et al. Chronic Chlamydia pneumoniae infection as a risk factor for coronary heart disease in the Helsinki Heart Study. Ann Intern Med. 1992;116:273-278. Smeeth L, Thomas SL, Hall AJ, et al. Risk of myocardial infarction and stroke after acute infection or vaccination. N Engl J Med. 2004;351:2611-2618. Ridker PM, Rifai N, Pfeffer MA, et al. Inflammation, pravastatin, and the risk of coronary events after myocardial infarction in patients with average cholesterol levels. Circulation. 1998;98:839-844. 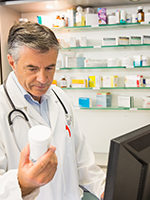 PATIENTS: Antibiotics are not always appropriate, but many patients believe that they must receive an antibiotic to treat common viral infections, including the “common cold,” flu, and many bronchial, sinus, and ear infections. Taking antibiotics will not cure these conditions, nor will it prevent those associated with sick people from getting infected. Moreover, the excessive inappropriate use of antibiotics has contributed to the worldwide bacterial antibiotic resistance, leading to “superbugs” that are becoming increasingly more difficult to treat with antibiotics. And, germane to the new meta­analysis by Almalki and Guo in this issue of the journal, the use of antibiotics—specifically the broad-spectrum macrolide antibiotics—may cause harmful, even life-threatening side effects. Azithromycin has become one of the most popular antibiotics prescribed to patients because of its ease of administration, tolerance, and broad-spectrum activity. It is popular among patients because it is a once-daily drug that can be taken for only 3 days as a full-course therapy. Indeed, people often make sure they have an azithromycin prescription on hand for an upcoming family event or a vacation. For now, azithromycin remains a very effective antibiotic when used correctly to treat a range of common bacterial infections. It also remains a safe drug. However, like all drugs, there is a risk–benefit ratio involved, and patients must become educated about the proper indications, administration, compliance, and ramifications. In 2001, a concern arose regarding azithromycin’s use and the associated risk for sudden cardiac death. In 2012, the US Food and Drug Administration (FDA) revised the “warning and precautions” section of the product information label for azithromycin to warn about the potential risk for fatal arrhythmias, specifically QT interval prolongation (ie, QT ≥440 ms) and torsades de pointes. Recent studies, including the present meta-analysis by Almalki and Guo, suggest that although azithromycin may increase the relative risk for a cardiovascular (CV) event, for most otherwise healthy patients, the risk is rather low. Therefore, patients must use appropriate caution based on their individual diagnosis and risk factors. If a patient has known risk factors, such as an electrocardiogram with a baseline QT prolongation, careful consideration must be made for an alternative antibiotic; or, if azithromycin is deemed medically necessary, careful consideration should be made to hospitalize the patient so as to provide inpatient administration of the drug with cardiac monitoring, until the treatment is completed. PROVIDERS: Providers should feel confident in prescribing azithromycin in the majority of patients who require the drug based on preferential bacterial susceptibility and/or patient allergies to other alternative antibiotics. That said, it is equally important for providers to know the concerns surrounding potential adverse events and be able to assess the risk factors and make modifications as necessary to reduce the risk for drug-induced cardiac events. In 2012, Ray and colleagues conducted an observational, nonrandomized study of patients in the Tennessee Medicaid program and found a 2.88-fold increased risk for CV death in patients taking azithromycin and a 2.49-fold increased risk in patients taking amoxicillin compared with patients not taking antibiotics.3 Although the study had limitations, it was largely the publication of this study that led the FDA to revise the “warning and precautions” section of the azithromycin label regarding the risk for fatal arrhythmias. In 2013, a prospective study by Svanström and colleagues found no increased risk for CV death with azithromycin in the general population, suggesting that the risk for azithromycin-associated CV mortality is limited to high-risk patients.4 This study may therefore be complementary to the study by Ray and colleagues rather than contradictory. So who are these high-risk patients? First, patients with a baseline prolonged QT interval are at risk for delayed repolarization and ventricular arrhythmias. Associated modifiable risk factors may include electrolyte disturbances, specifically hypocalcemia, hypokalemia, and hypomagnesemia. These should all be addressed before azithromycin therapy. Other nonmodifiable risk factors include acute coronary syndrome, heart failure, and hypertrophic cardiomyopathy. In the case of azithromycin, providers must search for a prolonged QT interval and associated CV risk factors. Taking all this information into account, providers must weigh the benefits and risks of azithromycin and appropriately monitor patients who are at high risk for life-threatening CV adverse events. PAYERS: The excessive use of antibiotics worldwide has created alarming health and health-related economic burdens to society at large. Bacterial resistance leading to “superbugs” is becoming an increasingly frightening threat to the successful treatment of historically common infections, leading to prolonged hospitalizations, morbidity, loss of income, and death. Pharmaceutical companies are finding it increasingly challenging to stay ahead of the antibiotic resistance challenge. Governments are concerned not only because of the impact on the population but also because of the real threat of bioterrorism and the power of pathogens as vehicles of terror and war. A worldwide outbreak could cause economic collapse and chaos. Even in the absence of such doomsday scenarios, payers are carrying the current burden of covering the cost of overprescribing antibiotics, as well as the potentially avoidable complications of these drugs. Furthermore, as the vicious drug-resistance cycle continues, payers indirectly carry the burden of the cost for research and development by pharmaceutical companies to continue to bring better and safer drugs to market. One particular adverse event that could be minimized is the risk for CV events associated with azithromycin. The findings in this fine meta-analysis by Almalki and Guo support the safety of this drug. However, as long as the jury is still out, payers should encourage thoughtful use and prescription patterns by providers. Payers should also continue to examine and review the clinical outcomes, adverse events, and the costs associated with azithro­mycin therapy. Arellano-Rodrigo E, García A, Mont L, Roqué M. Torsade de pointes and cardiorespiratory arrest induced by azithromycin in a patient with congenital long QT syndrome [in Spanish]. Med Clin (Barc). 2001;117:118-119. Giudicessi JR, Ackerman MJ. Azithromycin and risk of sudden cardiac death: guilty as charged or falsely accused? Cleve Clin J Med. 2013;80:539-544.